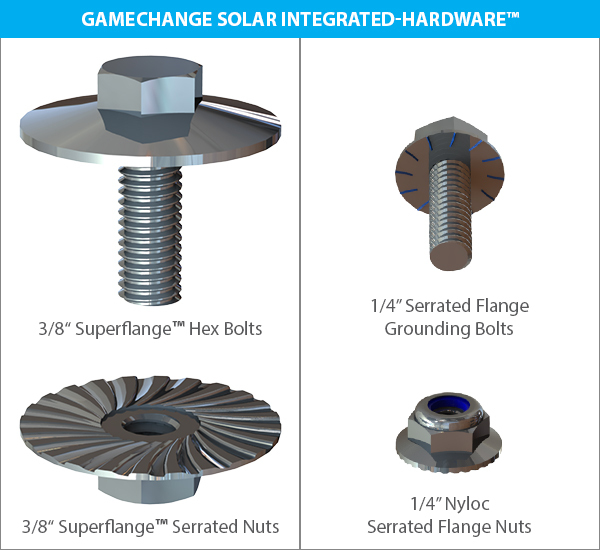 NEW YORK, NEW YORK – December 3, 2018 – GameChange Solar today announced the introduction of Integrated-Hardware™ by adding large flanges, serrations and/or teeth to nuts and bolts. This is especially important for module mounting hardware because the introduction of teeth enable the bolts themselves to bond directly to the module frame without needing the star washer. In effect, this allows GameChange to eliminate all washers and star washers. The significant reduction in hardware items speed installation not only because there are fewer parts to install, but also the parts are bigger, so easy to handle when wearing work gloves. In addition, they are harder to lose on a construction site. Derick Botha, Sr. VP Business Development, stated: “We listened to our customers and they asked for less parts and pieces. With the introduction of Integrated-Hardware™, GameChange has reduced hardware parts counts up to 20%. We have substantially simplified inventory, as well as meaningfully reduced installation time for GameChange fixed tilt and tracker systems for our customers. Integrated-Hardware™ is being rolled out throughout 2019 and will be standard for all GameChange systems by the end of the year."